A child can read well, but understand little of what they read. A child can spell and have a grasp of grammar, but produce lack-luster compositions. A child can solve a math problem by following the steps, yet lack numerical understanding. The ability to think and problem solve is really what I'm after. If a child can think and problem solve, the road to success is within grasp. The application of basic phonics, grammar and math skills is more important than going through the motions. If struggles with a particular concept exist, strong problem solving skills will aid in overcoming the challenges. As an adult, the ability to think through problems, to apply what is known to what isn't, and to know what information is needed and how to obtain it will lead to greater success than having the formula for the area of a cone memorized. I was given Building Thinking Skills Level 2 for review. Building Thinking Skills Level 2 is a hefty 408 pages targeted at grades 4-6. This particular title is reproducible and can be used with multiple children in your family. Both verbal and non-verbal reasoning activities are included in the ten chapters, along with an answer key. There are 1347 activities which will lead to improved vocabulary, reading, writing, math, logic, and figural-spatial skills, as well as visual and auditory processing. Not only will critical thinking skills be sharpened and applicable to academics and life, but higher grades and test scores will result. Building Thinking Skills Level 2 is not your typical fill-in-the-blank-with- regurgitated-information workbook. These are higher order thinking activities that require the student to describe, observe, compare, analyze, and process information. Chapters 1-5 have figural activities and chapters 6-10 cover verbal activities of the same categories. For example, in Chapter 2, Figural Similarities and Differences, students are given activities such as dividing shapes into equal parts, paper folding visualization, and shape comparison. In Chapter 7, Verbal Similarities and Differences, students are asked to examine language through analysis of words with similar and opposite meanings, supplying multiple meanings of a given word and providing a compare and contrast of two words. A sample page from one of the figural chapters is located below. A complete Table of Contents and other sample pages are available at The Critical Thinking Co website. Each set of activities is sequenced developmentally. First, the semi-concrete figural-spatial form is introduced. Once the child has had practice, then the activities are presented in the abstract verbal form. Many skills are first introduced by having the student select the correct answer from several provided answers. Next, the skill will be taken further by having the student supply the answer on their own, applying what they learned in the first set of activities. Building Thinking Skills Level 2 really is a wonderful tool for developing and engaging the mind. A software version of this title is also available. I already owned the software version and had the benefit of comparing the two versions. Many of the activities are identical. However, the software version has multiple choice and graphics added to some of the activities. For example, one activity included the words "basin", "canyon" and "mesa" for word choices to be matched up to given definitions. In the workbook, just the words were given. The software included a graphic of each, giving more information. All of the same areas and topics are covered in the software version. For children that don't like to write or favor computer work, the software is ideal. Features such as multiple-user capability, self-grading, difficulty level adjustment, and word puzzle reward games may make this version appealing over the workbook, depending your needs and child's learning style. Last year my son, age 9, worked out of the Level 1 book of this series and I was very pleased with the results. There were some areas that he did extremely well on and others I was surprised to see him struggle. For example, breaking a shape into separate components was difficult. This may not seem like a skill that would have a verbal component, but breaking a word down into components had been a struggle with our language lessons that year. The needed skill of breaking down a whole part into components runs across many areas. Through this series, weak areas can be strengthened for all subjects. Level 2 covers the exact same skills at Level 1 at a higher level and will be a nice continuation of what we did last year. My 11-year-old daughter has used many other products from The Critical Thinking Co in the past that focused on a particular area (e.g. Word Roots), but this was her first time using a title from the Building Thinking Skills series. She commented on the increasing complexity of the activities and said this would be a fun alternative to some of her regular school work. She is on the upper end of the targeted age and I will definitely consider purchasing Level 3 in the near future. Because many things come naturally to my daughter, I've noticed a lack of appropriate problem solving techniques when roadblocks are experienced. This series will develop and continue to build skill in this area. Building Thinking Skills Level 2 can be purchased for $29.99. The software version is $36.99. Free shipping is offered on orders $35 or more and you can save over 30% off on some of their other products with the current clearance sale. Many of the software titles have free demo downloads to allow you to try before you buy. Each printed product has sample pages available to help determine appropriateness for your student. The Critical Thinking Co. offers a 60-day money-back guarantee on all of its products, which promises you a risk-free purchase. I've been collecting The Critical Thinking Co products for some time. I have yet to be disappointed. I have confidence that if this particular title does not fit your needs or targeted level, perhaps one of the other 200 titles offered will, including other levels of the Building Thinking Skills series. Help your children learn to use the brain that God gave them and teach them to think! Be sure to check out what other TOS Crew members had to say about this and other products from The Critical Thinking Co by visiting the official Crew blog. My son has been given a gift of looking at things from an out-of-the-box perspective. He's always coming up with different ideas, building interesting creations, and generally runs a path all his own. He is also very logical in his thought process, allowing him to apply that creativity in a very systematic way. Usually this unique perspective is an asset. However, it can sometimes be a challenge, especially when it is applied to something like spelling. You see, my son is dyslexic. Like most dyslexics, he is intelligent, creative and mechanically inclined. Like most dyslexics, he struggles with spelling. The English language, where "ough" in tough, bough, cough and dough sounds completely different, does not appear to be a logical language. Children are taught the basic sounds of the letters without rules and then expected to learn to spell words that don't follow the sound patterns they are taught. Not only is this difficult for any learner, the dyslexic child is completely at a loss. 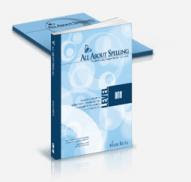 All About Spelling, by Marie Rippel, is a comprehensive spelling program with a multisensory approach. Based on the Orton-Gillingham method, spelling is explained in a logical fashion with rules the student can understand. All About Spelling gives instruction in customizable, step-by-step lesson plans with built-in daily review. The levels and word lists in the All About Spelling program are arranged by concepts and spelling patterns rather than by grade levels. Currently four of the six levels are available, with Level 5 due to be released in 2009. By the end of Level 6, the student will be spelling at the high school level. Children as young as preschool can successfully use the program. It is also ideal for older children who need remedial work. Additional student packets and spelling games are also available. I can confidently recommend this program to anyone looking for detailed spelling instruction. All About Spelling uses magnetic color-coded letter tiles along with a flash card system of phonograms, sounds, key rules and words. After some initial cutting and organization of cards at the beginning of the program, there is no teacher prep work other than gathering whatever new tiles and cards are introduced in the lesson. Lessons are scripted and well laid-out, making this program extremely easy to teach. Each lesson is divided into sections. The teacher is introduced to what will be covered in the lesson and materials needed. Before starting on new material, concepts from prior lessons are reviewed. Using the card system provided, focus is put on those items not already mastered. Following the review, a new teaching is introduced through interactive learning. New teaching is followed by applying the concept using the tiles and then on paper through dictated words, phrases and sentences. You can see a sample lesson from Level 1 here. It is recommended that most students start with Level 1 or 2. Concepts and rules introduced in these levels are foundational to the program. Students skipping the first levels will miss out on important building blocks needed later. Previous to using this program, my son had already received some Orton-Gillingham instruction. Orton-Gillingham has been a proven method for successfully teaching dyslexics, my son included. Dyslexics must have clear direction, specific rules and instruction on breaking words into syllables in order to properly hear the sounds. Both our prior program and All About Spelling meet these objectives. However, there are several distinct differences. All About Spelling focuses just on spelling. Many beginning and remediation programs combine reading and spelling together. Quite often a child having trouble spelling also is missing the phonics base that leads to successful reading. My son, however, is a stealth dyslexic, a concept developed by Brock and Fernette Eide. This means that he can read, and read well. At one point, there was a six grade discrepancy between spelling and reading. He is not in need of reading comprehension or fluency work. Other programs we've used had a large portion of the program devoted to reading skills integrated with the spelling instruction. All About Spelling has shorter lessons that cover just the material my son needs. All About Spelling is written for the parent or teacher that does not have training in teaching the Orton-Gillingham method. The lesson plans are clearly written, not intimidating and give the parent confidence that they can teach their beginning speller or remediate their struggling speller. Our previous program was geared more towards the tutor, though also parent-friendly. The method is not difficult nor complicated to use, but some programs give that appearance. The biggest difference is in the cost. While some may think All About Spelling is pricey at roughly $175 for Levels 1-4, cost and value are definitely relative. I had explored Orton-Gillingham tutors in my area only to find that the going rate was approximately $500 a month for 5 hours of tutoring. Remediation is not a fast process and most students will need 1-3 years of instruction. At $6000/year, tutoring was not affordable for our family. As an alternative, I started using a 10-level program that would ultimately cost about $3000 when completed. I was thrilled to find something affordable, though the cost was still out of budget of some families. All About Spelling is a tiny fraction of that price and so far is just as effective. I'm absolutely elated that All About Spelling is providing an affordable way for homeschooling parents to help their struggling spellers and give beginning spellers the foundation they need. The pros have already been discussed and fair outweigh any negatives. The biggest complaint I had was not only trivial, but has been remedied by All About Spelling. All of the cards used in the program needed to be cut from provided pre-printed card stock. Because there are a significant amount of cards used in each level, this wasn't a quick task. I am happy to announce that All About Spelling will now be printing the cards on perforated cardstock. Some parents may not like that this program is not one that the child can use independently. It requires a parent to conduct each lesson and direct the student through the activities. This isn't a con for me, since it is what my son needs. Furthermore, All About Spelling takes a significantly less amount of time than what we had been using. However, those needing a completely independent spelling program for their child will not find it in All About Spelling. Obviously, I'm thrilled with this product. This is an excellent product for *all* students. My daughter has always spelled above grade level, but I wish I had used this program with her when she was just learning to read and spell to give her a stronger foundation. My son is happy to use the program because he sees his own improvement in spelling. He's even surprised himself by spelling some more complicated words correctly, giving him further confidence. I will continue to use All About Spelling with my son and look forward to the release of the last two levels. Visit All About Spelling to view FAQ covering many more topics not in this review. The site also has some excellent articles on teaching spelling. Read up to 100 reviews on this product at the TOS Crew's Official Blog. My daughter and I were having a conversation the other day and the topic of computers was brought up. I mentioned I went through my whole school career, even college, without owning a computer. With a wide-eyed look, I was asked, "But Mom, how did you write your papers? Did you write them all by hand?" I had to explain that sometimes I did, but I usually used a typewriter, which is recognizable thanks to the American Girl Kit movie. On occasion, I went to the campus computer lab or found a rare lucky friend that actually owned a computer. The whole idea of functioning without a computer was completely foreign to her. If the conversation and reaction of amazement weren't so entertaining, I would have wallowed in my feelings of being downright old. I grew up in a time when a computer for school-aged children was a neat machine where you learned to program how to scroll your name. However, my 11-year-old can't imagine life without a computer or internet access. Furthermore, computers are now a necessity for her and my son's future and it is my job to educate them on their use - without school computer labs and tech-savvy teachers. What a relief to have discovered Motherboard Books! Motherboard Books, owned by Phyllis Wheeler, addresses the need for computer instruction for children learning at home through a variety of computer science instructional offerings. Let's Make a Web Page! is at 60-page ebook targeted at children ages 8-12. Upon completion of the ten short lessons, the user will have designed a web page complete with links, custom background, animations, sounds and photos. The final product will be ready to upload to the internet to a hosting site. Alternatively, the web page can be set as the home page of a browser, making a local website viewable only to those using that computer. My daughter has been toying around with html and website creation for about a year now. Most of her experience has been using free hosting sites with templates, but her real desire is to start a business and have a custom web page. Her excitement to try out this ebook was no surprise. Because she already had a purpose for her site, the interview portion was changed to a product description complete with a photo. Because her product involves buttons, she even took a photo of buttons, learned to modify it with a photo editor, and used it for her background. The resulting basic web page looked impressive. She had no negative comments. Even though she has experience with the internet, she learned quite a bit. "I didn't know websites were just folders with files in them," was one comment. The basic knowledge learned will be a great building block for further exploration and understanding to build more complicated pages. Aside from the great-looking end product, I was pleased with the content, instruction, and ease of use of this ebook. I really appreciated the portions on internet safety and the prompts to request help from a parent for certain steps. Internet safety should be a concern for any parent and Phyllis Wheeler was sure to address this topic. Also, it isn't assumed that the user has much computer knowledge, yet the instructions are not so remedial that those who do are irritated. Young children, and tech-challenged moms, can follow the steps to success. My 11-year-old was able to use this ebook completely independently. I intend to try it out with my 9-year-old, who will probably need a little help but will likely be able to do much on his own. The ebook can be used again as a manual to create more web pages, making this a resource that will be referenced again. Suggestions are made on how to continue making pages without buying software once the CoffeeCup trial expires. There is no need to print this product since all the work is done on the computer and switching from ebook to software is convenient. Let's Make a Web Page will be used as a guide for more web pages in our household. If you have a student that is wanting to explore web design but needs a safe and simple way to learn, Let's Make a Web Page! is a great introduction and can currently be purchased from Motherboard Books for $19.99 (reg. $29.99). If you are not completely satisfied, Motherboard Books stands by all of its products with a 30-day money-back guarantee. Be sure to check out the other computer science programs also available. Visit the TOS Homeschool Crew's Official Blog for more reviews on this product! When my daughter was younger, she had a favorite friend named Chip. She adored Chip. Together they would talk, play and enjoy their time together. Chip certainly was no ordinary friend. In fact, Chip was just a pair of eyes. Yes, just eyes. This pair of eyes could be slipped on a finger, which transformed into a nose, for an instant friend. The simplicity of Chip became a tool to engage the mind to think, experience and learn creatively. Puppetools, a subscription website, recognizes the power of play in learning through puppets. I'm sure Jeff Peyton, Puppetools founder, would appreciate my daughter's relationship and interaction with Chip. "to open the door to sweeping change in education by advancing the principle of play in teaching and learning." The idea of Puppetools is to provide a place for educators to support each other in using puppets in the classroom. 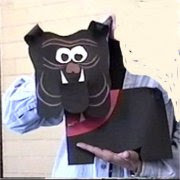 The website contains tutorials, videos, pictures of puppets created by students and teachers and a forum for discussion. Jeff Peyton has designed a paper hinge to be used as a base for puppet creations. Instructions for the hinge as well as 37 templates are included on the site. However, the idea of the site is not to be limited to the templates but to create your own puppets and then share with other members how you are utilizing them in your classroom through pictures, videos and posting on the forum. There are examples of teachers using puppets for unit studies, during reading circle time and even as behavior correction tools. The best way to describe this website is an accumulation of research on the value of puppetry and creative play along with a platform to brainstorm with other members on how to incorporate puppetry into the classroom. There are two subscription options. The regular subscription can have up to 30 users, significantly reducing the cost for individuals. While there is a lot of information on the site, navigation is more an exploration rather than a quick download of information. I believe the intent is for users to stay awhile and browse the site for inspiration. The forums seem largely under-utilized, though I suspect that Jeff Peyton would gladly answer any question or comment posted there. I would have liked to see more recent teacher and classroom videos as well. The research is long-standing, but the idea of sharing puppetry techniques in this format is fairly innovative and new; there seems to be a lack of members to effectively meet the site's goals. However, the platform for sharing is in place for like-minded puppet users to communicate with and inspire each other. While we still employ lots of creative techniques in learning, the days of Chip and other puppet friends in our house are sadly gone. However, I believe both of my kids would probably still enjoy making puppets and using them with younger children, giving puppetry continued educational value for older children. While this isn't a site that I would personally use, Puppetools is a unique resource that may benefit others. The site is designed to best fit classroom educators, either traditional or through homeschool co-ops, wanting to routinely incorporate puppetry into their teaching. Those involved in a church puppet ministry may glean information through a membership, especially if they are on a budget and need ideas for constructing inexpensive puppets. For individual users interested in incorporating puppetry at home and having trouble getting started, the trial subscription could provide some starting ideas to jump start imagination and creativity. Visit the Puppetools website to learn more. See what other TOS Crew members had to say about Puppetools by visiting the Crew's Official Blog! I've shared before that I much prefer hard copy products to digital, but software is a different story. I love software products. I think my software collection is second only to my piles of books. Much of what I own could be placed into the category of edutainment, where my kids can learn while playing. There is something about those silver compact discs that contain so much information and take up so little space. When a package arrived from Core Learning containing four of those shiny discs, I was anxious to see what treasure of information and activities they contained. Core Learning is an educational publisher of software, books, multi-curicular projects and online learning applications. They offer a variety of products, designed to meet state curriculum standards, for K-12 learners. Titles in the areas of mathematics, creativity/art, health, language, and critital thinking focus on skill development in both higher order thinking skills and important life skills. I received a variety of full version and demo titles from Core Learning. The style of the products varied greatly and I'll admit to having my favorites. Volume 1, titled Explore Your Body, provides an introduction to the human body, its parts, and functions with 9 short animated clips. Information is presented in a storyline through the adventures Doc, Sari, Emma, Hu and the Chicken. I would describe this series as a blend of Magic School Bus and CyberChase episodes. Each clip is approximately 5 minutes long and interactive with short quizzes and prompts. Volume 2, Explore Your Health, is a continuation of Volume 1 with the same presentation format. My 9-year-old son was really engaged by Explore Your Body and completed the entire disc in one sitting. This series follows the same set of charaters as the Health for Kids series. However, the presentation of information is set up such that the user can explore different areas instead of following a series of clips. After selecting a topic, the user reads the information provided and reinforces the information through animated activities and games. I was able to explore Unit 1 for this program. The full version has 7 units. Unit 1 had 5 lessons with an accompanying worksheet and quiz for each lesson, ending in a unit test. The presentation was straightforward and more textbook-like than the health series. One nice feature is the tracking for multiple users. Each lesson tracks the time taken, last status, last date launched, last score, times attempted and detailed summary for each lesson. This program is similar in layout as the Math Course Series. There are 7 units total, each having 4-6 lessons each. I had access to Unit 6, which covered parts of speech. The tracking features are identical to the math program. Sixteen art lessons are provided through animated movies, activities and projects. Art principles and history are taught through three categories: sayART, seeART, doART. My children went through this program several years ago as an online subscription under a different title. It is nice to see it being offered as a reusable cd-rom and at a cheaper price. It is fun, educational and sound art instruction. This is one you can view for yourself by checking out a free demo lesson. I've included these together because they are both digital art programs with a similar feel but serving different needs and users. Crayola Art Studio allows children to artistically create using a variety of tools without the mess. Not having anything to clean up was my favorite feature of this software! While there is much to be said of sitting children down with a variety of media to touch, explore and create, reality is that mess, time and expense prevent me from doing this as often as I'd like. 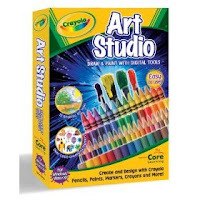 The Crayola Art Studio has a selection of 12 realistic art brushes, e.g. colored pencils, oil pastels, paints, markers, and crayon. 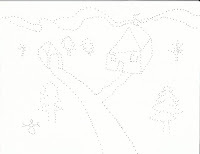 The program can be opened in one of two levels, Begin to Draw Level and Art Studio Level. I was impressed with the computer representation of the medium. For example, the water colors would become less vidid as you continued to use your brush without "reapplying" more color to your brush and the oil pastels and chalk had the appropriate visual texture. Children can create strictly from the imagination, alter digital images of their own or start with special Crayola images. Below you will find a creation of my daughter's using the symmetry tool, a favorite feature. Crayola Art Studio is a simplified version of corefx. Your artist will have many more features at their disposal using the powerful corefx program. Not only can the user draw and paint, but photo-editing and animation features are also included. Artist tools can be used individually or mixed and blended, with realistic and unique results. Basic, Junior and Advanced Levels are all included in the package, making this a program for differing abilities. If you have an older child interested in graphic design or if you'd like a digital art program for a wider range of abilities, you may want to invest in corefx rather than starting with the Crayola Art Studio program. Programs such as Crayola Art Studio and corefx appeal to me because their use is endless. Instead of taking the user through a series of activities, these sort of programs are a platform for creativity and development of thinking skills. The potential and limits are largely with the user, rather than the software. Rather than just take my word for it, check out the 3-day demos available on both of these products. You will not be able to save or print your masterpieces created using the demo, since these features have been disabled, but you will be able to explore all the other features that are available on the full version. Visit the TOS Homeschool Crew's Official Blog to read other Crew members' thoughts on these products. We've all heard of writer's block, but is there such a thing a mathematician's block? Having a math-phobic daughter, I can assure you that it really exists. When it comes to math lessons, she seems to freeze up, despite high ability. She's decided she isn't good at math, though working above grade level. Her perception is somewhat self-fulfilling, making time spent doing math a struggle in our household. We've tried many different math programs, from core to supplement to fun software to straightforward textbooks, in my quest to find torture-free math instruction. I've used ALEKS in the past and was happy to revisit is again for this review. ALEKS is a web-based service that utilizes artificial intelligence for comprehensive math instruction for grades 3-12. It is designed for independent math learning with tracking for the parent or school teacher. All instruction and work is done completely online using the ALEKS software. No additional materials are needed. The registration process is easy. Parents are given a master account to oversee the progress of their student(s). Once your child's account is established, the parent assigns a starting course, which can be changed at any time. With the student's first login, they will be given an assessment of their knowledge of the material for that course. Students will not be asked to repeat information they have already mastered in the course and will be given a starting point specific to them. After the initial assessment, if it's discovered the course selected is too difficult or too easy, a reassessment for a different course can be assigned. One of the unique features of ALEKS is the use of a pie chart. Each course is divided into components, e.g. whole numbers, fractions, geometry, and visually represented in a colorful pie chart. Students have the freedom to choose what portion of the pie they'd like to work on with a simple click. Each slice is filled in as they've mastered the concepts. If material from other areas need to be learned before continuing on in a particular slice, the software will not allow further work until the child masters the necessary skills in other slices. ALEKS is not a drill and kill program. Each new concept is presented with a short explanation and practice problem. There is an option to get further explanation if needed. After the practice problem, children work on like problems until 2-3 consecutive problems are answered correctly. At this point, a portion of the pie is earned and a new concept is introduced. Accelerated learners will appreciate the opportunity to move forward quickly. There is no need to worry about retention. ALEKS will later reassess to be sure the concepts are mastered. Automatic assessments occur whenever the student has added 20 new items to the pie, or if 10 hours in ALEKS have passed without an assessment. If it is found that the student did not retain the information, students lose that portion of the slice and need to earn it again. This was one of my favorite features! Answers are inputed directly; there is no multiple choice. If you are the type that requires your children to show each step of the problem, you may not like the fact that students are required to just have a correct final answer to progress. However, incorrect answers will force the student to review their own written work. Both of my children have learned the hard way that sloppiness will require reworking the complete problem because they can't decipher their own work. ALEKS will automatically email the parent a report of the student's progress. A quick look at the History portion of the report will reveal the the hours spent working, the number of items learned per hour and the progression made. This will indicate whether or not the child's time is spent productively on ALEKS. The printable report will also show the current pie and portions completed, concepts learned, concepts ready to be learned and more. As mentioned earlier, ALEKS has been used in our household prior to this review. The first time we utilized ALEKS was a couple of years ago at the height of the math drama in our household. My daughter, 9 at the time, was convinced that either her mother or the math book was wrong and spent more time arguing or crying about doing math than actually doing it. Being ahead in math but developmentally not ready to move forward, I gave us both a break by setting her up with ALEKS for a full year to solidify concepts already introduced. It was money well spent. Probably our greatest benefit was ALEKS forced my daughter to work and learn math independently while "saving face" when she had an incorrect problem. It was just her and the computer, which would not respond to her crawling under the table and crying. Offense was not taken if the computer told her the problem was incorrect nor could she argue with the computer. The pie was rather motivating to her, which surprised me some. When she lost part of her pie during an automatic assessment, it motivated her to earn back that portion of the slice in the same session. Having work completed visually represented with a filled in slice was encouraging. Because the students are assessed and not forced to repeat concepts they already know, I've also used ALEKS as a supplement or a break from whatever math program we are using. When doing this, my daughter has easily shifted to ALEKS for a few months. For her revisit for this review, I selected a topic we were already studying. She was able to review material and learned some completely new concepts as well. My 9-year-old son is a very different math student, but he also seemed to like ALEKS during his time using it for this review. Being a child that hates to write and prefers mental math, he really appreciated not having to show work or even write answers. On occasion he seemed to tire of reading the explanations of how to work the problem and would miss important instruction. When this happened it didn't take much explanation on my part to get him back on track. He mostly worked independently. Overall, it seemed to be an effective program for him as well. Family discounts are also offered. When compared to other web-based math programs, ALEKS comes at a very reasonable price and is just a fraction of the cost of tutors. A 48-hour trial is offered on the website, but clicking on the link below will give new users access to a full 1-month free trial. The ALEKS website contains tutorials, course lists, and FAQs for more information. If you were looking to permanently outsource your math instruction, this would be an excellent choice and much cheaper than other options. It works wonders as a supplement or temporary core curriculum for times when your child (or you!) needs something different. Independent and accelerated learners will thrive with this program. Based on our own experience, I'd say it is effective with strong-willed students too. In general, students needing detailed instruction or that crave interaction with others may need other long-term choices, but ALEKS may be an effective short-term supplement. I would love to have ALEKS as a permanent resource in our homeschool, but our budget doesn't allow use of it as our core curriculum on a permanent basis. It has been a great tool for our family as a supplement or core curriculum on a semi-permanent basis. Definitely take advantage of the trial offer if you think ALEKS may be a good resource for your family. Read what others thought about this program by visiting the TOS Homeschool Crew's Official Blog. I remember being in 3rd grade and learning the times tables. The teacher had been assigning a table a week and for some reason I had gotten behind. This was normally not my nature, but I think the issue was that I saw no point in rote memorization of times tables. I don't recall understanding the concept, just being told to memorize them. Around the time of my lagging behind, quarterly report cards came out and the teacher mentioned to my parents that I was behind. I remember being disappointed in myself, but it wasn't until a fellow classmate completed all 12 tables, while I remained on the 4s, that I was spurred into action. I may not have understood the math concept, but competitiveness gave me the proper motivation to learn my 4-12 tables in ONE evening. When it came time to teach my own children multiplication, I made sure they understood the concept, could skip count and saw usefulness of knowing the information. When I became successful in this goal, I thought the actual memorization would either be automatic through use or be an easy task. After all, I was able to memorize most in one evening, without having any understanding. Sadly, I was very wrong in my expectations. My daughter simply refused to memorize the tables. She fully understood the concepts but didn't want to be bogged down with the actual memorization, a character trait that remains true today across subjects. There came a point when her lack of automacity slowed her math work down so much that I eventually gave her a table to look up the simple multiplication answers so she could move on to more difficult concepts. My son learned to skip count and then held on to that method for dear life. Ability to skip count shows understanding of the concept, but it can be cumbersome if that's the only way you know how to get the answers. For each times table, he would start at the very beginning and skip count his way up, using fingers to keep track. I tried to get him to memorize the tables, but he didn't seem able. Thankfully, Trigger Memory Systems has thought of creative way to help children quickly learn the times tables. 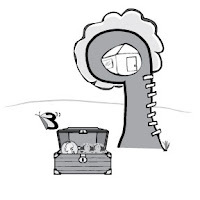 Times Tales is an approach to learning multiplication that has nothing to do with math. Yes, you read that correctly. 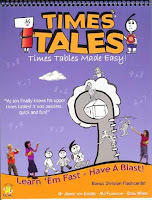 Times Tales is described as "a creative, innovative, mnemonic-based program that makes it fun and easy to memorize the multiplication facts". Using mnemonics, children can learn difficult times tables through easy to recall stories and associations. Imagination is an important memory tool and engages parts of the brain not associated with rote memorization. Mnemonic methods are particularly important for children with learning challenges, e.g. ADD or dyslexia, and most children will simply find this effective method plain fun. If you'd like to read more about how this method works, read the first two questions on Trigger Memory Systems' FAQ page as well as the article linked there. In Times Tales, each factor (the numbers being multiplied) is represented by an easy to remember character associated with the number. These characters are used in short stories integrating the product (the answer) both verbally and visually. 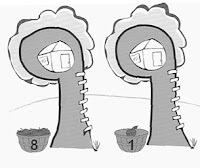 For example, the number 8 is represented by Mrs. Snowman, who has the shape of the number. 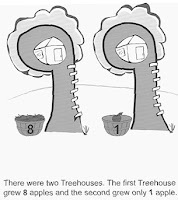 Below you will find an example for 9 x 9, with the number 9 represented by a treehouse. Once the story is introduced, the wording is removed for more practice. After the initial session, flash cards, games and quizzes are provided to further cement the stories in memory. "YES! Buy this product if your child is struggling with multiplication tables." I first discovered Times Tales about four years ago when I purchased it for my daughter, who was 8 at the time. The original version covered only the upper half of the 6, 7, 8, and 9 tables, since these are the most difficult for children to learn. Tables with the factors of 1, 2, 3, 4, 5, and 10 were not included in the original version. When I received my updated version for this review, I was impressed with the improvements. Not only is the product as a whole more visually appealing, the quality is better as well. Furthermore, I was pleased to see that the 3 and 4 times tables have been added. At age 8, my daughter was well ahead in math concepts but struggled with the rote memorization of the times tables. Since she has a strong language arts lean, I thought learning math through stories might be appealing to her. True to its claim, my daughter learned the upper times tables in an hour using Times Tales. I was truly shocked at how quickly the program worked. While I did very little review with my daughter, she recently admitted that she still uses some of the stories - 4 years later! Times Tales has also been successful with my 9-year-old dyslexic son. This child has no problem remembering every single complicated name of the Lego Bionicle characters, but 6 x 8 escapes him without skip counting. Associative learning has been a necessary tool in his bag of tricks for learning. Within a half hour, he was able to tell me every single times table covered in the program by looking at the text-free picture. After going through the pictures twice, I started to verbally quiz him on the tables. He was able to answer me without his routine skip counting and quicker than normal. With a little more review, I know this program will improve the speed at which he does his math work. I am really pleased with the results of Times Tales. While it is important that your child understand the concept of multiplication, sometimes other techniques are needed to improve automaticity. Engaging the imagination has always been a way to make learning more fun. With Times Tales, learning and math work become more efficient too. If you'd like to test out the program, or if you own the original, you can purchase the new Supplement that covers just the upper 3's and 4's for $12.95. Be sure to check out the other great products sold by Trigger Memory Systems. If you'd like to read what others thought of Times Tales, visit the Official TOS Homeschool Crew's Official Blog. Mom: Why didn't your room get cleaned like I asked? Child: I don't know. I forgot. The first phrase often means “I don't want to tell you.” The second sometimes does mean what is says, but many times it really means, “I'm overwhelmed.” Frankly, the condition of my kids' bedrooms makes me overwhelmed too. Trigger Memory Systems, founded by three homeschool moms, has created a tool that takes those seemingly daunting tasks and breaks them down into manageable steps for children. The Clean 'N' Flip products are top spiral bound booklets that give step-by-step instructions for various household tasks in a fun, systematic, and visual way. There are three titles in the series, Bedroom Cleaning for Kids, Laundry for Kids, and Zone Cleaning for Kids. In each title, children complete the task listed on the page and then flip to the next page until completion of the task. Cleaning the bedroom is broken down into 8 easy steps to help your child independently clean their room to completion. Even preschoolers can follow along by using the illustrations. The last page of the flip chart is a customizable “Day of the Week Jobs!” list for tasks not included in the previous pages. Children are walked through the steps of making a pile of all out-of-place items, sorting them in laundry baskets and putting the items away. There is nothing novel about this system, but having it all put in steps and put together in a colorful book seems to make cleaning an out-of-control bedroom more manageable. It sure avoids those “I forgot” steps and keeps the kids on track. The end result will be a bedroom which both parent and child will consider clean. I'm ashamed to admit that I went off to college not knowing how to work the laundry machine! It has been a goal of mine to make sure that my kids are functional in that area. They've received laundry tutorials several times, but I'm not exactly consistent with the requirement of doing the task. As a result, each time I do request their help, in enters the “I forgot” phrase again. The task of laundry is broken down into 7 steps, from sorting to putting away. There is also a page that discusses load size, water temperature and wash cycle options. All the steps are simply explained and illustrated. The only step I would add is to check pockets for items, but perhaps that is a step that applies more to families with little boys. It certainly is an important step in our household to keep clothing and items from being ruined; I've found some rather interesting things that have gone through the wash. It should be easy enough to add in steps specific to your family at the bottom of the appropriate page with a Sharpie. I intend to permanently hang this item from a cord in my laundry room so the kids can reference it any time they are requested to help with the laundry. The Zone Cleaning chart is different from the previous two in that it is laminated and comes with a dry erase marker, making it more customizable and durable. If you are a Flylady follower, you'll appreciate this chart. There are three individual zones detailed - kitchen, bathroom and living room. Each zone is broken down into 5-7 steps over several pages. The first page for each zone has a spot for a child's name and time of day, e.g. morning, afternoon or evening, with the backside having a customizable "Day of the Week Jobs!" page. The following pages are the individual steps to be performed with check boxes. The chart could easily be used with several children, each taking a zone for the week or with one child, doing one zone a day. I had my children work together with the kitchen zone and was pleased with the results. They seemed to like having each step detailed and were better able to share the task. Anything that has my children working together towards a common goal gets kudos from me. The price structure varies depending on whether the titles are purchased individually or as a package. Note: There is currently a special offer from Trigger Memory Systems. If you order a Times Tales Deluxe or a Zone Cleaning for Kids and put FREEFLIP in the comments, you'll get a Bedroom Cleaning for Kids FREE! I initially thought $30 for three small booklets was a bit steep, but I'm all for a system that helps with repeatable tasks. If you are a family that needs charts but the results with your children are ho-hum, this is certainly something to try. These are likely excellent tools for special needs kids who need a little extra help to be independent in tasks. The Clean 'N' Flip charts are great for all ages, customizable, durable, portable and definitely more visually appealing than charts on the wall. You can learn more by going to the Trigger Memory website. So, has this system reduced the “I don't know”s and “I forgot”s in our household? Not only have these phrases been reduced when I assign chores, it was much to my surprise when I stepped out for an errand only to find upon my return that my 9-year-old son had picked up the Laundry for Kids Clean 'N' Flip on his own and did a load of laundry. Need I say more? If you've been homeschooling for any length of time, I'm sure you've experienced homeschool burn-out. If not a full-fledged burn-out, you've probably had days where it seems like there was little time to teach. Overscheduling is difficult to avoid and we homeschooling moms wear many hats. It would be nice to just hand a hat over on occasion. Fortunately, there are programs like Time4Learning to help the busy homeschooling family. Time4Learning is a multi-subject, state standardized, online subscription service for preK-8 students. The subjects of language arts and math hold the primary focus with social studies and science offered as supplemental and bonus subjects. Upon registering for a subscription, getting started is extremely easy. You can read a previous posting on our experience in the first weeks of using Time4Learning here. Once logged on, your student can choose what subjects they'd like to tackle from the Launch Pad. Each subject has a clickable button graphic. Subjects are further broken down into lessons. With each lesson being marked as complete when done, the student can systematically work through the lessons of each subject independently. A parent can sign in and preview any lesson without having that lesson marked as completed, if closer parental supervision is desired. If you'd like to assign your student subjects and lessons to complete, the Activity Finder is available for use. Each assignment is given a number, which can be referenced in the Lesson Plans in the Parent Administration Area. Simply give your student a list of assignment numbers they are to complete and they'll be able to quickly find them with the Activity Finder. How do you know whether your student has completed the assigned tasks? Time4Learning tracks all assignments completed, date and time of completion, and scores earned on quizzes. Knowing Time4Learning is helping parents keep accountability, your student will be motivated to complete tasks. Perhaps an even better motivational tool is the Playground area. You can read more about this feature in a previous post here. How are the lessons presented? Lessons are presented in a fun way through animation. My kids enjoyed the lessons and working independently on the computer. My youngest particularly liked the science section and quickly competed all that was available for his grade and continued on to the next. Both of my kids, ages 9 and 11, would request Time4Learning when given the option of what school work to do next. For children that are visual learners and tire easily with a lot of written work, Time4Learning is ideal. The lessons also keep the attention of children who can be distracted easily. Advanced students will appreciate being able to work as fast as they'd like and at various grade levels among differing subjects. Time4Learning sets the stage for individual work, but parents need to check on the progress of their student for full optimization. While Time4Learning does track progress, the software allows the student to progress on through the lessons, or continue to repeat lessons, regardless of how they are performing. My son did not perform well on a quiz, yet he was able to continue on to the next section. All lesson can be repeated at any time and it is easy enough for a parent to reassign lessons that need a bit more work. Parents will need to log in to see if there are any areas where their student is struggling and need addressing. Time4Learning is not intended to replace the homeschooling parent nor should it. Academically, the content is based on state standards. The Math and Language Arts sections are considered to be comprehensive and serve as a core resource. The Science and Social Studies topics are provided as a free bonus, though they certainly could be used as jumping off points. While alignment with state standards can be seen as positive, some Christian homeschoolers may want to be aware that this alignment means evolution content is in the lessons. Also, the humor in the lesson is definitely geared towards the child user and sometimes crosses over into crude category, especially in the upper grades. While kid appealing, it may not always fall in the realm of what is appropriate within each individual family. If this may be a concern, I would suggest you preview lessons to get a feel for the content in this area. Time4Learning has put an effort forth to help make its product adaptable for many. The tools and support are in place to make this program a foundational curriculum, a supplemental resource and even a remediation tool for tutoring or after-school programing. Whole subjects can be removed from an account upon request. For example, if a parent is not ready for their child to be exposed to evolution, they may have the science lessons completely removed from the account. This could also be done with any other subject that you'd prefer learning take place from another source. Also, grade levels can be adjusted up or down for each subject, making this a resource that can be customized to your child. Time4Learning has set up a moderated Parent Forum covering a variety of topics. Here parents can chat and share about the various ways they use Time4Learning for their own homeschool. I spent some time browsing the Parent Forum where parents can share how they adapt by posting in a variety of topic message boards such as Supplemental Resources by grade, Special Needs, Time4Learning for Summer Use, Christian Perspective and more. Is there parent support for subscribers? I found the parent support and customer service to be fabulous. The information provided when getting started is well-organized and comprehensive. Time4Learning really goes to great lengths to make sure its users understand how the system works and can be utilized. Furthermore, feedback is requested and appreciated as they are always trying to improve the site to meet the needs of members better. The experience of other parents has always my best source of support and the Parent Forum proved to be quite useful in answering any questions or concerns. Members can also join in a real-time chat Tuesdays and Thursdays from 1-2pm EST to ask questions of Time4Learning Member support. Any time I needed to contact customer service, I always received a prompt, professional, and courteous reply. Who would most benefit from Time4Learning? Time4Learning can be used as supplemental or as a core curriculum. To use as a core curriculum, a Scope and Sequence and Lesson Plans are provided to help in planning. I personally liked to use the program for those busy times of the week when I couldn't give individual attention as much as I would have liked. In addition to busy families, Time4Learning would work particularly well for families with multiple ages. Younger children can be more independent and continue on with school lessons while individual attention is given to older students. Because the subscription can be renewed on a month-to-month basis, this would also be an excellent option to consider during time periods when homeschooling is more difficult, e.g. when the family has new additions or during prolonged illnesses. It would also be a great tool for working homeschooling parents or new homeschoolers. Time4Learning is available for $19.95/month, with each additional child at a discount price of $14.95/month. If you pay for twelve months at once, your fee is only $169.95 for each child. You can get a pretty good feel and overview of the program by viewing the lesson demos, where you can try out some of the lessons, visit the Playground and more. If this product is of interest, I recommend you take advantage of the 14-day risk-free trial offer. This will give you an opportunity to fully explore all that Time4Learning offers as a helping hand to your homeschool. My son is 9 now, but I think this is the best "socialization" story I have to date. Below is the story as I shared with my local support group. My 7-year-old son has been going to a stuttering therapist since late spring. He has a really good rapport with the therapist and enjoys going to his sessions. Dr.: "It's not really my business, but I was just curious, how is your son with other kids?" Me: "Oh, he's great! He has lots of friends, other kids seem to like him and request to play with him, he gets along..."
Dr.: "No, that's not what I mean." I give him a puzzled look and he explains. Dr: "There are, what I see, two types of kids. There are those that are really popular and outgoing, and then there are those that are well, nerdy. Typically it's those that are nerdy that tend to stutter. (Note: Our therapist was/is a severe stutterer, so I wasn't offended by this assessment really.) This isn't really any of my business, but I know you homeschool, and well, your son is such a nice kid. He comes in here and is so well-behaved. He's polite and does what I ask. He only sometimes gets a little silly at the end or when we are playing games. I was just wondering how much he's around other kids." well-behaved! What a hoot! And this is a concern? Would he be concerned if my son were rude and disrespectful? Would he not stutter if he were rude? This therapist is well-respected and I was told "the best" in this field. He travels around the world talking about his program. I hope he isn't telling his colleagues to watch out for those well-behaved kids. Anyhow, it just so happened that I was doing some fall planning during their session and had written down all of the kids' classes and activities outside of the home. My son's totaled about 7 classes or activities a week, not to mention play dates, field trips and other non-weekly things. After I regained my composure, I spoke with just a smile rather than laughing in the therapist's face. I told him of my list and starting rattling off the activities. He cut me off again and said "Okay, okay. I guess it doesn't apply here. I was just curious. It obviously isn't an issue." He still looked confused. hang out with to put it all in balance. What About Socialization E-Book Giveaway! Shortly after we started homeschooling, we were introduced to a great theater company that offered quality programs for schools and families. We have been enjoying these productions over the years and have gone as a group with our local homeschool support group. Normally all the actors are adults. However, once a year children are allowed to try out for a part in A Christmas Carol. My children have performed in a couple of productions through our homeschool group and have enjoyed it greatly, but this year they decided to branch out and audition for A Christmas Carol. This was quite different in than their previous experiences. First of all, not every child that auditions gets a part. Secondly, this would be their first play not only with adults, but also with professional actors. I have to say that while I'm pleased that both of my children wanted to try out even though they may not get a part, I'm particularly proud that my youngest decided to give it shot. Sit down; I have a homeschooling success story coming on. My youngest was extremely shy as a toddler and preschooler. If an adult spoke to him, he'd usually stare straight ahead and pretend he didn't hear them to avoid needing to respond. Furthermore, his speech was unclear and at about the age of 6 he developed a very obvious stutter. He's been through years of successful speech therapy. All of his articulation issues are now gone. However, once a stutterer always a stutterer, so I was told by his stuttering specialist (also a life-long stutter). There was a time he could barely get a word out, which I'm happy to say is no longer an issue. However, when ill, excited or even during a growth spurt, he'll still have periods of stuttering. What does all of this have to do with homeschooling? I honestly have to say that my son would have never auditioned for any theater part had we never homeschooled. I believe he would have been eaten alive in the public school system, worsening his shyness and speech issues. I'm amazed at how people always ask about socialization and homeschooling. Public school "socialization" would have not been positive for my son. However, homeschooling has created a confident and outgoing boy rather than the opposite. Furthermore, my daughter has always been naturally outgoing and in need of lots of live body interaction. So many opportunities have been available to her through homeschooling. She's able to participate in many more activities homeschooling than she would if she were confined to a regular school schedule. Not only that, the people in which she comes in contact are from all types, rather than a classroom of identical age students. Again, homeschooling has been wonderful for her needs as well. It doesn't seem to matter what the personality of the child, the socialization issue gets brought up. If the child is shy, people think the public school socialization needs to "fix" them. If the child is outgoing, they think they "need" the socialization at school. I've been presented with the "S" question many times. For the most part, I think the inquisitor has thought very little about the question which they are asking. You can read about the best example from personal experience I have of this to date here. As we head into the holidays and associated gatherings, many of us are bound to get the "S" question by curious, or perhaps even hostile, friends and relatives. Maybe this barrage of questions will even make you question yourself on whether or not you are doing the right thing. Prepare yourself in advance with the new The Old Schoolhouse e-book titled What About Socialization. You can read all about it here. One lucky person will get this e-book, a $12.45 value, for FREE! To enter, all you need to do is leave a comment with your name, email address, and a comment or story about homeschooling and socialization. On Thursday, Dec 18th, I will pick a winner by random drawing. Oh...and the results of the auditions? Both of my children received parts in the play. My formerly shy stutterer? He's Tiny Tim and is having a blast with the production. I posted last week about getting started with Time4Learning. I have a few more thoughts now that we've jumped in. I'd like to discuss what my children like most about Time4Learning...the Playground! The Playground is an area where your student can kick back and play games after doing some of the more academic activities. Of course, this is the favorite part of the program for my kids! As I mentioned earlier, we used Time4Learning for a few months last year. At that time, my youngest had not discovered the Playground. This time around, being older and wiser, he found that area shortly after the first log in. Time4Learning automatically sets a default of 15 minutes of lessons for 15 minutes of Playground time. This might be fine for younger kids, but I didn't want my kids to spend half of their time in the Playground area. Changing the time allotted on the Playground was easy. I simply signed in, clicked the parent icon, and changed the settings for 30 minutes of academic time to 10 minutes Playground time for my younger. For my oldest, I changed it to 45 min/10 min. There is a timer in the corner of the screen that shows how much longer the student needs to work on lessons before being allowed to go to the Playground area. I have to admit, even though my kids have plenty of computer games, the whole idea of earning the right to play on Time4Learning has been motivated. What do you get when you have a closet full of art supplies, two kids, and a homeschool mom with an engineering degree? Lots of child-directed home art projects and outsourced art lessons! Honestly, I really do appreciate art. In fact, I spent quite a bit of time drawing in my younger years. However, my approach to art isn’t exactly, well…artsy. I’m great at copying things, my mechanical side enables me to see how things go together and I have strong spatial awareness. However, I’m just not that great at coming up with ideas on my own and I certainly have an aversion to the mess some art projects create. I’ve looked at a few homeschool art programs, but they either seemed too complicated or too crafty. As a result, art has always been an outsourced subject in our homeschool. Unfortunately, art classes don’t come cheaply. Spending over $50 or more a month in weekly art lessons for one child is not unusual, certainly not an expense that could be done on a permanent basis for most families. Because of cost and lack of ability, art has often been put on the back burner in our homeschool. After all, aren’t the 3Rs much more important? The Spears Art Studio for K-8, designed by Diane Spears Ed. D, has really forced me to rethink my position on art instruction. I’ll admit that I was skeptical when my review package arrived. First of all, the program is on a CD-Rom with PDF files which isn't my favorite format for materials. Without being able to flip through pages, the small package was a bit deceiving. Secondly, the first few projects I scanned appeared to be busy work, crafty and revolve around holidays. It shouted of my mediocre public school art experience as a child. However, I’m glad I was forced to dig in to complete this review. Otherwise, I would have missed out on a real gem. Spears Art has impressed me on several levels. The introduction continues with skills addressed in the program, the importance of art instruction for all subjects, art concepts, how to teach and analyze art and more. Once sentence in particular caught my eye. These aren’t just craft projects about the holidays. First of all, this is a high-quality Christian art curriculum. Each lesson is tied into Scripture, making this a Bible and character development tool as well. However, it would not be an accurate statement to say this is just a Christian art curriculum. Also integrated into the lessons and projects are language, science, social studies, math and even music. For example, the first week of April’s water theme has the students learning some natural facts of water, relating earthly water to the water of the Spirit, and interpreting forms of water artistically. The related Scripture verse, Psalm 119:9, is about purity. Biblical stories about water, e.g. Jonah and Jesus calming the waters, are introduced. Vocabulary words, art and otherwise, are discussed, e.g. tempest, turbulent, pitch, refraction, and abstract. The privilege of Western society to have clean water and the importance that other societies have this same basic need prompt students to consider how they can assist ministries helping in this area. This is quite a bit of meat that is outside of the actual art project. Not only is Spears large on substance, it’s massive in the sheer size of 497 pages, 269 projects, and 137 reproducible patterns, posters and examples. Thirty-five weekly themes are provided with at least one project per grade level. Since the different level projects are based on the same theme, Spears is a great curriculum to use for teaching a group of multiple age children. Additionally, this is a program that you can use year after year for the same child. Do not let the thoroughness of this program intimidate you. While the projects for each grade level are different, much of the prep work for the lesson, e.g. Scripture references, art history images, topic information, is the same. Spears does the legwork for you by detailing the objectives, listing images to retrieve and including a teacher inspiration section for discussing related topics. Patterns needed for a project are included, though art supplies do need to be gathered. I found that I had acquired many of the needed supplies already from years of taking 10-12-week outsourced art classes and gifts to one of my artsy kids. Some of the projects require planning for materials (e.g. baby food jar lids) and you may have an initial expense of buying some supplies. However, a complete supply list is provided in the appendix and each week's lesson lists supplies needed for the projects to aid you in planning. These lists are also available to view at the Spears website before purchasing. At first glance, those lacking artistic talent may feel overwhelmed with the art instruction portion, but the lessons are really presented in such a way that almost anyone can have success. The use of images, along with a sample picture of a completed project, will help your students tap into their own artistic talent, even if the teacher is a bit lacking. 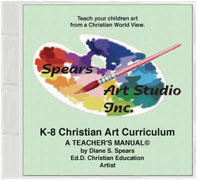 Spears Art Studio K-8 can be purchased for $39.95, shipping included. Cost is not nearly as important to me as value. This price equates to a mere 15 cents per project. Or, if you prefer to break it down by year, only $4.50 per school year for only one child, less for multiple children. WOW! Even when you account for the added costs of materials and printing, this is still an exceptional deal. A combo package with the cd-rom and printed manual is available for $134.95, but you’d be better off printing off a personal printer, which I'm guessing will probably cost around $30. Otherwise, just printing what you need reduces the print cost significantly. Also available at the Spears website are a high school art program for $29.95, a calligraphy package and literature guides. My initial reaction was to recommend this program for a co-op situation. Spears Art would be fabulous tool for group teaching for your local support group. However, you really can’t go wrong purchasing this for your own personal homeschool, whether you have many children or just one. It's Christ-focused, complete, organized, and a great value. So, I ventured out. We had our very first at-home art lesson. Below you will find the results of the January Week #1 lesson with two children, ages 9 and 11. I used the Grade 4 project for both kids. 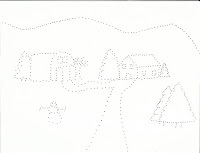 The theme was "Winter and Snow" and the project was to create a monochromatic snow scene using a punch technique. Not bad, eh? I think we have more projects in our future. Visit the Spears website to view FAQ, an article on the importance for art instruction, 2 FREE weeks of sample lessons and to make your purchase. To hear what other Crew members had to say about this program, visit the Official TOS Crew Blog.